Under the surface of excellent exam scores lies a corroded system. A report from the state. How good are Tamil Nadu’s schools? If you take a look at the exam results in the state, you would get the impression that they are in sound shape. Between 2010 and 2016, the percentage of students passing the state’s tenth standard board exams rose from mid-eighties to mid-nineties. So did the scores and the tally of students getting a centum, or 100%. In the same period, twelfth standard results showed a similar trend. The pass percentage increased from 85% to 91%, along with the average marks and centums. However, these numbers clash with the findings of the National Achievement Surveys. Conducted by the Central government’s National Council for Education, Research and Training to track learning outcomes, the survey conducts classroom tests every three years for students in the third, fifth, eighth and tenth grades in all Indian states and Union territories. 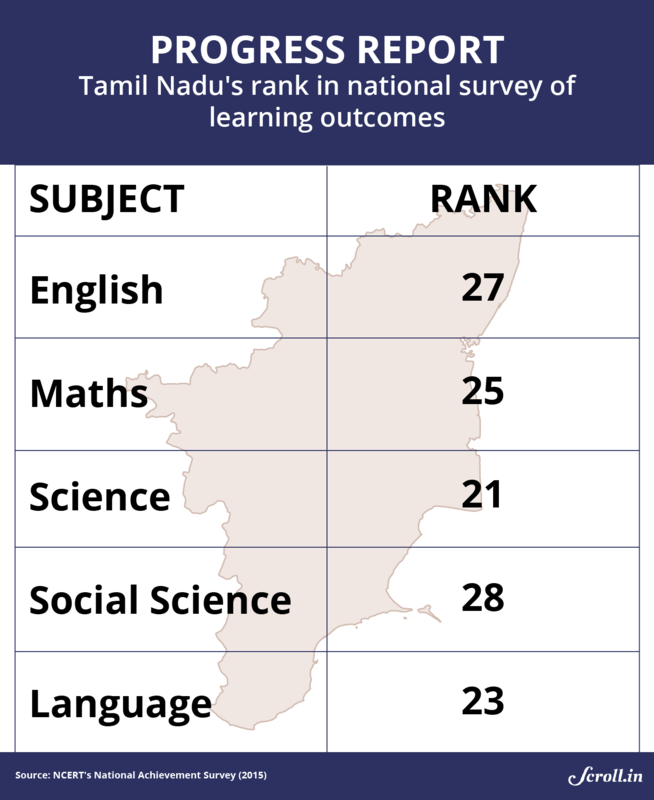 Its assessment of India’s tenth standard students in 2015 placed Tamil Nadu’s students close to the bottom in every subject. This contradiction is puzzling. After all, Tamil Nadu is regarded as among the best governed states in India. But as well-regarded among educationists are NCERT’s National Achievement Surveys. These results are central to Tamil Nadu’s assertions that it has improved education delivery. But a closer look at Tamil Nadu’s exam results reveals some odd features. Just this year, when the state government’s Department of School Examinations mailed exam results to media houses, its one-page summary included data on pass percentages and the number of children scoring centum in maths, science and social science for 2016 and the two past years. Scroll.in asked the school examinations department for detailed tenth standard exam results, but got no response. However, people close to the department provided the information, which Scroll shared with State Education Secretary Sabita Dayashankar, with a request to respond. She did not reply. One unusual pattern appears when looking at the number of marks scored by students taking the exams. One would expect a bell curve here – in any test, some students fare very poorly and some very well, and many average. 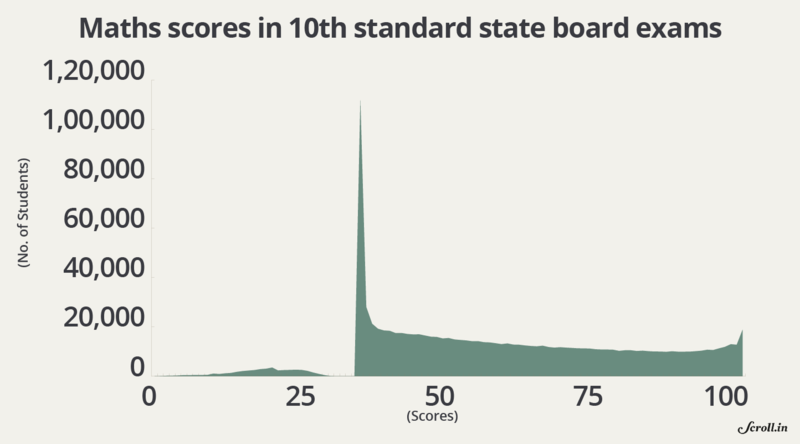 So, a graph showing the number of students and their scores should be slim at either end – the high and low scorers – and thick in the middle. But that is not how these charts look. A total of 10,23,566 students sat for the tenth standard board exams this year in Tamil Nadu. In the maths graph, the curve rises slowly till the score of 20 and then falls again, so much so that no student achieves 33 or 34. But then, as many as 111,776 students score 35 – the passing grade. This is followed by another steep fall, and then almost a plateau. About 12,880 students score 98. And, then finally, there is a second, smaller spike, as 18,754 students get 100 marks. For science, the graph is very different. After staying very low till the score of 17 (just 10 students) and low till 38 (860 students), it jumps at 45 (8,612 students). It falls till 49 and then steadily climbs again till 95 (38,226 students). Another 32,861 students score 99. And 18,642 students get a perfect score of 100. Other graphs – for the tenth and twelve standards, in 2016 and 2010 – show similar patterns. Some have a huge spike at 35. Others peak only in the nineties. Besides these, there are other puzzles in the data. In this year’s tenth standard board exams, four subjects – English, maths, science and social science – had the same proportion of students passing them: 92.6%. It was of a piece with previous years. In 2015, in the state’s tenth standard board examinations, English, maths, science and social science notched up exactly the same proportion of passing students: 91.9%. These anomalies are symptoms of a larger crisis in Tamil Nadu’s schools. It is a crisis that was decades in the making. But first, the backstory – on what Tamil Nadu’s schools were like until 2008-’09. At the time of Independence, Tamil Nadu had a bewildering array of schooling formats, said a former official in the state examinations department. There were government schools, matriculation schools (run by and for the British), Anglo-Indian schools (which focused more on English) and Oriental schools (focusing on Sanskrit and Arabic). After Independence, the Central Board of Secondary Education as well as the Indian Certificate of Secondary Education entered the field. By 2005, this had boiled down to a three-horse race between government schools, matriculation schools – now run by private individuals and trusts – and CBSE schools. These three differed in important ways. Government schools taught in Tamil. CBSE schools followed their country-wide curriculum. Matriculation schools taught in English. Though government schools were the leaders in the race, matriculation schools made up the fastest-growing segment of the state’s education sector. The reasons for this went beyond the language of instruction. Matriculation schools, for one, set their own syllabus, and held their own examinations. This created a striking – if problematic – difference. “What is taught in a sixth standard school elsewhere is taught in a matriculation school’s fourth standard,” said the former examination department official. 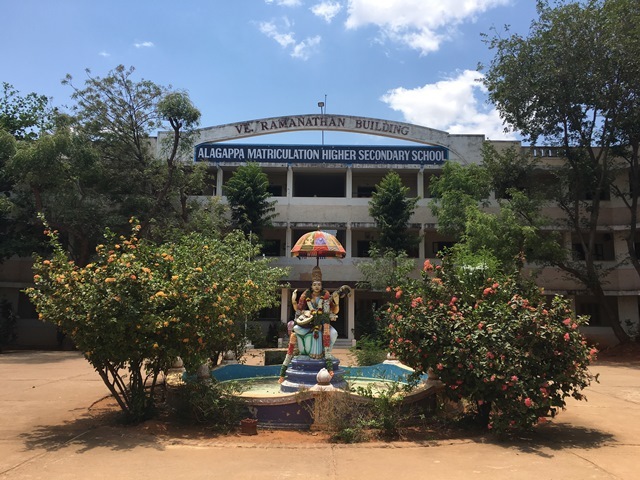 The resulting sales pitch – that the matriculation school was better than the state board school – resonated with parents. Despite government schools handing out freebies and staffing more qualified teachers, matriculation schools were more attractive for parents. As it happened, many students were the first in their families to get schooling, and so parents rated schools on the basis of their pass percentages. This had its own set of consequences. In a competitive market, each matriculation school ended up placing a premium on delivering good results, achieved in two ways. A lot of the learning was by rote. Second, says a consultant who works closely with the state education department, examination papers were usually cobbled together from a composite of question papers from the previous five or six years. Amidst this rivalry, matriculation schools were more demanding on students than state schools – especially the more serious ones, like church-run schools. However, given their emphasis on rote learning, the category as a whole lagged behind CBSE schools, which placed an emphasis on understanding concepts. And so, around 2008-’09, when the DMK was in power, this system went through an overhaul. Thenarasu was the man in charge. Working under him, a group of government officials and educationists came up with a multi-pronged approach to revive education. Create a common syllabus for government and matriculation schools, and bring them under the same state examination board. Junk the insistence on rote learning and replace it with activity-based learning. Revamp the test-based evaluation system – scrap exams till the ninth standard, allow schools to hold exams in the ninth and eleventh standards, and give the state board the responsibility of conducting exams in the tenth and twelfth standards. Around this time, the DMK government abolished entrance examinations for colleges, making performance in state boards the determinant of college admissions. Earlier this year, as campaigning for the state elections entered its final weeks, this reporter met Thenarasu, a bespectacled man in his fifties, at his village near Madurai. Thenarasu explained the rationale for the changes. In the activity-based system, however, if all 30 students in a class need to acquire 20 skills, and 15 have them all, 10 have some and five have none, the teacher has to make an extra effort. “Technically, you have to acquire all of these skills before you can go to the next class,” Thenarasu said. This was a complex transition. After all, the state was trying to remake a system on the go. At the same time, there was the possibility of creating a more homogenous schooling system. As Gomathi Nachiar, principal of a CBSE school in the small town of Karaikudi, noted, CBSE uses activity-based learning as well. Eight years on, it is apparent from the NCERT surveys that the project did not work. But the key question is why. 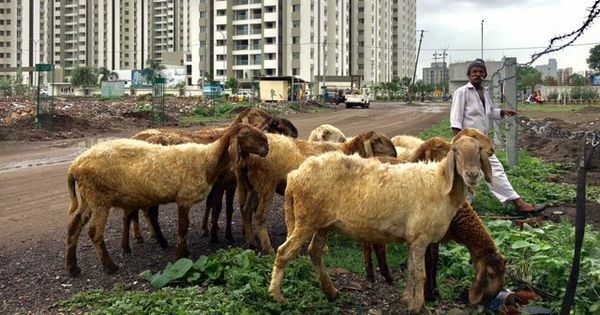 Why, despite the government’s well-intentioned reforms, did the overhaul fail? The next part of this story will attempt to provide the answers.